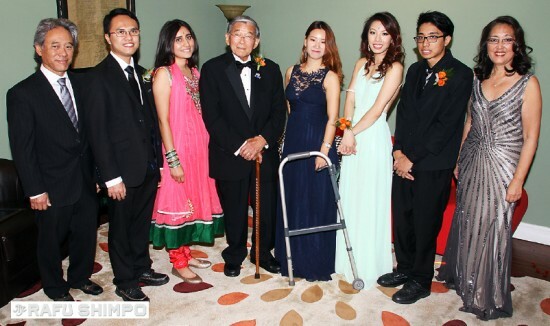 Asian and Pacific Islanders with Disabilities of California’s first annual awards gala, held Oct. 25 at the historic Cicada Restaurant in Los Angeles, was a sold-out event. Pictured from left: Mark Matsui, director of Disabled Students Program at Rio Hondo College; Raymond Kwong and Daphna Patel, graduates of the APIDC Leadership Institute and students at Pasadena City College; Lifetime Achievement Award honoree Norman Mineta, former U.S. secretary of transportation, who supported passage of the Americans with Disabilities Act when he was in Congress; APIDC Leadership Institute graduates Joanne Lee of PCC, Silkvia To of Cal State L.A., and Kevin Phung of Rio Hondo College; Patricia Kinaga, APIDC chairperson. The students were recommended by their colleges based on leadership potential to become advocates on behalf of APIs with mental, physical and developmental disabilities. Four of the students have disabilities and one is studying to become a rehab specialist. The students received interactive training in the Asian American civil rights movement; the disability rights movement; research data on APIs with disabilities; public speaking skills from State Controller John Chiang; communications through the media (e.g., press releases); networking skills; coalition-building; fundraising and organizing in the corporate world; branding; formulating mission statements, goals and objectives; fundraising in the nonprofit and foundation world; and independent living perspectives. At the graduation ceremony on June 1, Guy Leemhuis of the California Commission on Disability Access commended the students on their commitment to raising the visibility of young APIs with disabilities.